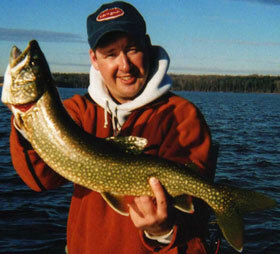 Catch Big Lake Trout with The Binsky. I am an avid Bass fisherman but first and foremost I am a fisherman. Unfortunately, being here in New Jersey, the winters can be brutal and brings ice to pretty much all my regular fishing holes. For the past few years instead of residing myself to the indoors and thumbing through fishing catalogs creating wish lists I have turned my attention to Round Valley and its abundant lake trout fishery. It is an interesting change of pace from my normal fishing quests during the year. The RV trips were so rewarding it even enticed some of my fair-weather fishing buddies to join the fun. The lure of choice is The Binsky, a lure made by Fish Sense Inc., a company I am proud to be a part of. The Binsky was created on the theory of strikes by recognition. The vibration of the lure is a trigger for a fish’s natural instinct to prey upon vulnerability. Vulnerability is huge, it shows a fish that its efforts and expending energy are most likely going to result in success. This is especially key for species that become lethargic in cold water temperatures. It’s all about presenting that ultimate feeding opportunity and The Binsky does that very well. Always have a game plan. Before I got a little bit of knowledge of RV under my belt I looked at a map and marked some areas that I wanted to fish during the day. I’ll look for ledges, humps, and bottom structure such as timber or foundations. At the ramp, I take notice of other variables such as wind direction, which may make me fish certain areas first like wind blown points. One of the biggest mistakes anglers make with the Binsky is poor time and water management. They tie it on and just start fishing the whole lake in a circle. 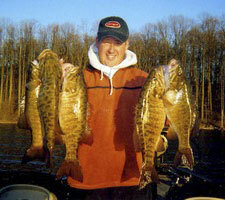 Fish with confidence, look for where the fish SHOULD be based on seasonal patterns. Figure out the high percentage areas and move from spot to spot. Especially during the winter, fish will set up in “wintering holes.” Discover a few of these on your home lake and you should find the fish active in one of those areas trip after trip. During the months of December through February I primarily focus on water depths of 50 to 75 feet at Round Valley but never discount going shallower if necessary. After I launch and proceed to make my way to my first waypoint, my eyes are glued to my gps/sonar. Many times, I will locate schools of lake trout as I run from spot to spot. If I see this on my sonar, I immediately mark a waypoint and stop over the fish. 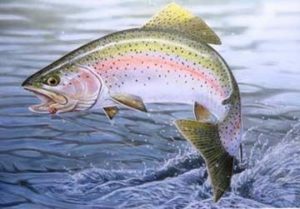 Often if I am fishing over 50 feet I turn the sensitivity on my sonar over 90% and I can see the trout a lot easier. I also turn up the ping speed, this sends out more sound waves to echo off targets making a school of baitfish more recognizable. This comes in handy when moving at high speeds. I also like this because it allows me to follow The Binsky straight down and watch it as it bounces off the bottom. Pay attention to every detail. As I work the Binsky I take notice of the feel of the bottom. It may feel soft and mushy and then I will feel the bottom harden up. At times fish will relate to these subtle changes. I may get hung up and pull up a piece of wood or just a small amount of weeds. Sometimes it does not take much to hold fish. If I am fishing a hump I look where the fish are located in relation to it. In my experience when the fish are positioned on top of it, they are more active than when they are at its base. The way they bite your lure can also be an indication of how they are feeding. The more aggressive the strikes, the more I tend to catch off of that area. Don’t get hung up on an area if you see fish and they are not biting. Mark the area and move onto the next. Fish will become active for small periods so I often fish the same spots multiple times throughout the day. Remember fishing with confidence and aggressively chasing the fish will get you better results than aimlessly drifting and waiting. Mastering water management with your time is one way to greatly increase your success and do wonders for your approach no matter what tactic you choose. Now, how does one work The Binsky blade bait? There are a few very important factors in the cadence I use. How high I pull the bait off the bottom, how long I let it sit between hops and how aggressive I work it. I too often hear and read that there is only one strict way to work it. It is key to experiment with your retrieve. There are cases where I simply let it sit on bottom and the fish just pick it up. In many cases after beating up on a school of fish, I change to a very aggressive cadence with hard high snaps to reignite the school. As mentioned earlier I turn the ping speed up on my sonar to see my Binsky as I fish it. If the fish are suspended off bottom I can real it up and actually see myself stop it right where the fish are so I can have it right in the prime strike zone. There are times I start to reel in and we have seen a fish follow it right off the bottom and before you know it, you are hooked in. It is pretty wild once you take the time to experiment and fine tune it all. Sometimes it is just a matter of dropping it to the bottom and reeling it straight back up, I may throw in a pause or two along the way. It is always important to visualize how rod movement above water translates down below. For instance, it is important to have good straight line with no memory. If part of your cadence is pulling curls out of your line it gives you a false idea how much you are actually moving your bait. For this reason, I always have a bottle of line conditioner on my boat. 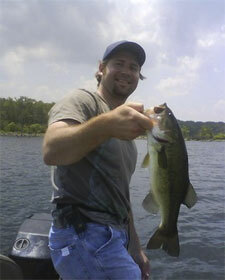 I do not always fish The Binsky vertically. When certain areas prove to hold fish on consecutive trips I will hit those areas and methodically fan cast it looking for moving schools of fish. In cold water conditions, I look for steep drop-offs coming off the shoreline. Fish will set up on these steep drops because they can easily access shallow or deep water by simply moving vertically in the water column. Variables that make these areas even better are chunk rock or a transition in cover at the drop-off. I will sit off these spots in deep water and cast up shallow. After the bait hits bottom I methodically hop it down like it is a virtual set of stairs. Most times, you will feel a tick on the fall or when you lift up you will feel dead weight. I recommend a 6’9″ to 7′ rod med. to med. heavy fast action, 1/4 to 3/4wt. 10-20lb test line rated. You want a fast tip so you can keep good contact with the bait and feel every vibration. With braid you will have great feel and contact with your bait. If I use it, I usually throw 20lb test. It is a limp line so it is important to control the lures fall on a semi-taught line so it does not get caught up in the hooks. It is also important to set your drag slightly lighter than if you were throwing mono-filament. With braid having no stretch you do not want to risk pulling hooks when a fish decides to make a run. Braid is a great option when fishing the Binsky around wood because it is very strong and if you get snagged you can pull logs to the surface or put enough pressure on it to rip it out. I don’t like to use it around rocks because it cuts too easily on sharp edges when little pressure is applied to pop it loose. Heavier mono or flour is a better choice because it gives you the advantage of seeing abrasions so you can cut off any damaged line and retie. is a good option but I find when the water temps start to drop below 50 degrees it becomes hard to manage. I like to throw the Binsky on 12lb Trilene XT. I have gone as light as 8lb and as high as 17lb. I like a reel with a high gear ratio,7.0:1 simply because I like to pick up my slack between hops quickly. Also sometimes, when striking the Binsky fish will knock slack into your line and I want to get my line tight fast and get a solid first hook set. Hopefully some of these tips will get you well on your way to many productive and fun times on the water. I am always open to discuss any questions so feel free to contact me. Ever since I was a child melting rubber worms in my mother's frying pans trying to make lures, I was told I am obsessed with fishing. Am I obsessed? Maybe, but it is through this obsession that we are able to bring you Fish Sense Inc. Our #1 goal is to convey this passion through our products. We will make every effort to ensure that you aren't just fishing but you are CATCHING! I have been fishing almost my whole life and these past couple of years my passion and dedication toward the sport have grown tremendously. The same passion and dedication I have toward fishing will be put into the daily operations of Fish Sense Inc. to reach its highest potential.